Can a Foreigner Apply for Divorce in Singapore? In order for foreigners to file for divorce in Singapore, they will have to establish that the Singapore Courts have jurisdiction to hear the proceedings for divorce. According to Section 93 of the Women’s Charter, in order for a couple to file for divorce in Singapore the couple would have to satisfy the following requirements to establish jurisdiction. You are habitually a resident in Singapore for a period of 3 years immediately preceding the commencement of the proceedings. What does being “Domiciled in Singapore” mean? The term domicile generally means the place where a person has his permanent home. Singaporeans are generally presumed to be domiciled in Singapore, though there are exceptions. However, foreign expatriates here on an Employment Pass are generally not considered domiciled in Singapore. What does being “Habitually Resident in Singapore” mean? Habitually resident suggests that the residence is voluntary and the person has an intention to settle down in Singapore or his/her actions suggest that he/she, in fact, had an intention of settling down in Singapore. The habitual residence must also be for a continuous 3 years or more immediately preceding the commencement of the proceedings to suffice. The continuity of the 3 years will not be affected if the person chooses to briefly travel or visit his home country briefly during festive seasons. Writ for Divorce, Statement of Claim & Statement of Particulars – the Statement of Claim must specify which facts the Plaintiff is relying on to ask the Court to grant a divorce. In the Statement of Particulars, the full details of the grounds declared in the Statement of Claim should be set out. Proposed Parenting Plan – an Agreed Parenting Plan should be submitted if both parties have managed to agree on the care arrangements for the children after the divorce. This is only necessary if there are children who are below 21 years old. Proposed Matrimonial Property Plan – an Agreed Matrimonial Property Plan is submitted if both parties have managed to agree on what to do with the HDB (Housing and Development Board) flat after the divorce. This only necessary if there is an HDB flat that needs to be divided between parties. All these Court documents must be filed with the Family Justice Courts. The Family Registry will accept the documents for filing if they are considered valid. Contest the divorce – The Defendant can contest the divorce by filing a Defence (with or without a counterclaim) and a Memorandum of Appearance, within eight (8) days of service of the divorce documents. The copy of Memorandum of Appearance & Defence, along with the divorce documents, will then be served. However, if the Defendant wants to contest the divorce, but has ignored the divorce documents, the Plaintiff can ask the Court for a divorce hearing date through filing the Request for Setting Down Action for Trial. The Court may proceed to arrange a divorce hearing date, hear the case, and grant the divorce even in the absence of the Defendant. Not contest the divorce – it will be considered as an “uncontested divorce” with a Hearing of the Divorce Petition consequently. The Plaintiff can then file an Affidavit of Service and set down the matter for trial. Not contest the divorce but contest on the ancillary matters – the Defendant can file the Memorandum of Appearance specifying which matters he/she asks to be heard on. Once the Interim Judgment hearing is concluded, the Court will set up a session to hear the Ancillary Matters, and request the Defendant to file an Affidavit of Assets and Means. To settle the divorce and all the Court proceedings, the Plaintiff should apply for the Certificate of Making Interim Judgment Final three (3) months after the Interim Judgement has been granted by the Court and the Ancillary Matters orders have been made. When the certificate has been received, both parties are considered officially divorced. What Legal Issues do Foreigners Face after Getting Divorced in Singapore? If you are an Employment Pass holder, your immigration status will remain unaffected by the divorce. If you are on a Dependent’s Pass, however, it will be cancelled, and you will have to leave Singapore within 14 days. Alternatively, you would need to search for a job and apply for an Employment Pass. If your spouse is a Singapore citizen and you are here on a Long Term Visit Pass, it might also be revoked following the divorce. Once the Dependent’s Pass is cancelled, he or she is given a social visit pass or tourist visa to stay in Singapore, which could be 30 to 90 days. He or she is not allowed to work during this period. Should I Initiate my Divorce in Singapore if I am a Foreigner? Should I Divorce Somewhere Else Instead? It is worth considering filing for divorce in Singapore as Singapore uses a fused legal system wherein only one set of legal fees is charged as opposed to two sets as in countries such as the UK. In contested divorce matters, mediation is compulsory in Singapore, which could be more cost-effective if it is successful. In uncontested cases, the procedure is very much easier and very cost effective. An uncontested divorce in Singapore can even be completely settled within 5 to 6 months as long as the parties are willing to cooperate. When will it be More Advantageous to Divorce in Another Country? One way it could be advantageous to divorce in another country would be if you are familiar with the matrimonial law in that particular country and feel that the law in that country could benefit you more in a divorce. 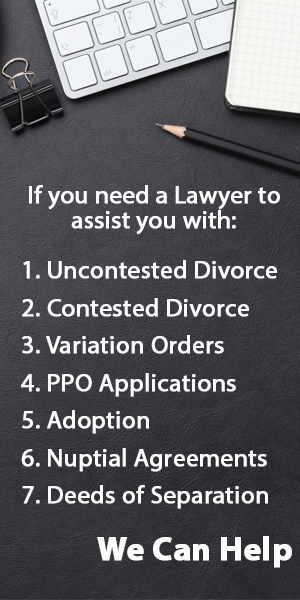 If ancillary matters are your main concern, do note that you should also get competent advice from a lawyer from the jurisdiction you intend to divorce in. As explained above, a contested divorce happens when your spouse does not agree to your terms involved in the divorce proceedings such as who gets custody of the children. Unlike an uncontested divorce, there are usually less fixed packages offered by law firms because the amount of work and the length of the proceedings depends on many uncertain factors. Fixed rate packages in such situations also tend to be high (usually starting from $8,000) and can escalate to $30,000 and above easily. The more common practice for such divorces would be to pay your lawyer on an hourly basis. The fees can range from $150 – $250 per hour to as high as $350 – $500 per hour for different law firms. Hire us to do your Expat Divorce. We answer all your queries within 24 hours.